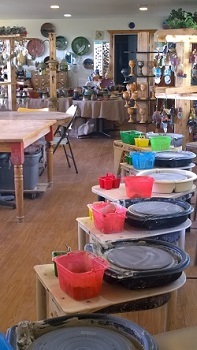 Have your birthday party if you are between 7 and 90 at the Pottery Gallery and School. You and your friends can enjoy personal instructions on the potters wheel in a fun atmosphere. The price is $25.00 per person and includes the 120 minutes on the wheels. The $120 is for 6 people, if you have more people just pay the different when you book the time with Doug 210.494.8633. Also included is all the clay, glazes, time you need to glaze, and firings. Call and set the time now for your party and get ready for fun. 6 people minimum.